Sambath was my tuk tuk driver. I met him as I was struggling to get off the rickety boat upon my arrival in Battambang, Cambodia. He started as my tour guide and eventually became my friend, as I became more and more intrigued about his life and home country. KAYDO: Tell me a little bit about yourself. SAMBATH: I was born in a refugee camp on the Thai border in 1988. My family had escaped to the camp in 1979, and we stayed there until 1991 when many refugees moved back to Cambodia to participate in the UN-sponsored elections. When we arrived back in our home province of Battambang, we were considered ‘new people’ since we had abandoned our country for safety. There are currently ten people living in my small house: my mother and father, my oldest sister and her teenage daughter, my other sister with her husband (who taught me English), my older brother’s son and daughter whom we care for, my younger brother Sambon who teaches at Countryside Class, and myself. Sambon is studying Marketing at the University of Management and Economics in Battambang Town. I also studied there, and will soon receive my Bachelor’s degree in Economics. I work to support the family as well as to put myself and my brother through school, I work as a tuk tuk driver and guide in the province, which I have been doing since 2009. K: What is Countryside Class and when was it founded? Why did you start Countryside Class? S: Countryside Class is a community-based school program on my family’s property along the river in Kampongseyma Village. Back in 2010, one of my friends asked me to give him some English lessons in the evenings. During those lessons, several village children used to come and listen along. 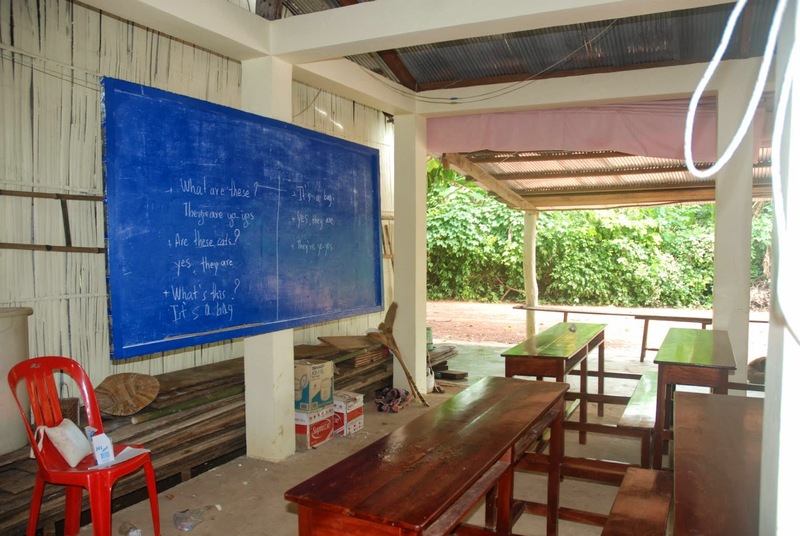 So, we turned it in to a school, setting up makeshift desks and a chalkboard under my house (many houses in Cambodia are raised on stilts due to flooding). We started with only 10 students, but over the past three years, a lot has changed and we now have two classrooms, a library, three teachers, and around 100 students. Much of this expansion is due to financial support from the French organization Avenir Pour l’Enfance and individual donations out of Malaysia. Our students come from different age groups, and many attend the school for free since their families cannot afford the $1.00 per month fee. The money that does come in is set aside to help pay for special events. Sambon also has been teaching traditional Khmer song and dance, and the students have performed at the local pagoda during major holidays. This past Khmer New Year in April 2013, we partnered with World Vision and Phare Ponleu Selpak for the show. What’s really special about Countryside Class, though, is that the school functions as a focal point in the community for children to learn, to interact, and to work toward an improved life. Today, the wish of the Countryside Class is that all Cambodian children will be educated, have good character, and that they will lead their country and people forward to development. We move toward this vision by teaching positive attitudes and values to children through teaching, reading, and community bonds. The underlying value to all that we do is the stringent belief that education is the route to changing Cambodia’s future. We’ve already seen many positive changes as the influence of our program is growing within the community, and we’re excited for growing that impact through implementing our development plan. K: How is the Countryside Class funded? S: Previously, the school was maintained on a volunteer basis by my brother and I with funds from the students who could afford a small monthly fee and from community donations. We were also very fortunate to have donations from foreigners who visited our school while travelling in Battambang. The French organization Avenir Pour l’Enfance has always been very generous and granted us the money to build our classrooms. They have also recently provided money to pay for at least 4 salaries over the course of a year. With that money, we have added two English teachers and a dance teacher. Because of the new teachers and the second classroom, we have been able to take on many more students. K: What impact has the Countryside Class had on the community? S: Before, many of the children in our community were not very interested in their studies and did not have much ambition to educate themselves. Now, many of the kids are excited to go to Countryside Class. They want to learn and are becoming passionate about other skills, like art. The school also gives the students an opportunity to become friends with others in the community by socializing in a positive environment. K: How has the Countryside Class had an impact on YOU? S: Countryside Class is my favorite thing in my life because it’s something I can do for my country and my country’s future. Moreover, it develops my own life and the lives of my family members as well. My family is not a rich one, and education for me is not a way to earn money, so I developed Countryside Class as a place for my ideas for my country and also worked in the town to support my family. I particularly love that the school is located on my family’s property because my whole family can with work it to help the rest of the community and my family can be affected by the students and Countryside Class’ vision and ideals as well. Sometimes being responsible for Countryside Class is very difficult for me because it distracts me from my job and studies, but I’m happy to do it because it’s a small sacrifice that I am happy to make for the vision of the school. ← Stay Fit and live the GoodLife on your Travels! What an incredible story … amazing what you can learn when you genuinely talk to the locals!